Today, Celebrity Blog Index crossed the landmark figure of 25,000 page views. The credit goes entirely to the readers who have been actively giving feedback and, thus, helping in the improvement of the site. and, best, of all share it with their friends and invite them over to this great Celebrity Blog Directory. Meghana Pathak, of Expressions of My Experiences, generously gave me the Humane Award. What a sweetie she is! 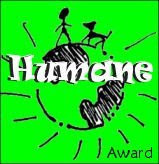 The Humane Award is presented to bloggers the giver feels are kindhearted individuals. They regularly take part in that person's blog and always leave the sweetest comments. Sneha Shrivastava - Sneha's Diary!!! If you are a blogger this is one site you must visit. It began as I started collecting links to some sites very useful for bloggers. Lately I've been using it to upload the Blogger Templates designed by me. This is my online Art, Design and Photography gallery. You'll also find the templates and wallpapers designed by me here. This blog is a collection of some links I'd recommend people to visit. Some software recommendations are also there. Here I just write 'super-short' reviews of all movies that I see. Briefly mention the story followed by a line or two of commentary. I follow a 'Traffic Light Rating System'(designed by me ;). This is an easy way for me to keep movie-watching in control. Formed primarily for friends who ask my opinion about the movies that I've seen. This blog was once upon a time my most visited blog. This blog started as Guftagu - taking inspiration from the conversations about love that I had with the people around me. But as it got more and more about love and less and less about Guftagu I decided to rename it to isbaat-e-mahabbat(Proof of Love). Recently I realised that I've been using this blog to imprison my thoughts in the jail of words. And so the new avatar: Verbal Prison. I do not see any changes to it after this, but, then neither did I see any changes earlier. "Just started a new blog. About half an hour back. The idea came to me about 2 days back. The intention is just to keep track of the various celebrities who are blogging away." Well, am through with the designing of the site. Its time to test and finally post! Feedback is welcome. Also, lemme know if you feel there is an error(especially like the one I've mentioned above) anywhere. This blog site is under construction. Add yourself as a follower so that you can receive updates as and when the site goes live! Again, just like religion, this is something that you get by virtue of your birth. But, unlike religion, the percentage of people who change their nationality is much more, especially in developing countries. People move to other countries, usually developed ones, seeking better opportunities and with time settle there. What reminds one of his/her nationality - well, sports matches, formula 1 races, chess/billiards/golf games, job/college forms, registration forms on the internet and most importantly the collective hatred of the people of one country towards another. Like in the case of India-Pakistan. As I mentioned in the case of religion, at heart I have only 1 religion, I am a human. Similarly, my nationality too is limited to forms. At heart, I am just a human, I am a citizen of this world. While people are dreaming of breaking this country into smaller parts-into a greater number of states, or are fighting for pieces of land India-Pakistan, India-China, India-Bangladesh, just like so many other countries around the world are, I dream of USIS. USIS stands for the United States of the Indian Sub-Continent, something on the lines of the European Union. And, this is to start with. One day we may have another USA - United States of Asia. Or well, a USE - United States of Earth. Or, if I am not going too far, UPA - United Planets Alive - comprising of all planets across all universes with life on them. My last statement, I am sure, would bring a smile on the faces of Manmohan Singh and Sonia Gandhi - the leaders of UPA, United Progressive Alliance. Let me make it clear I'm not supporting them, the acronym came up just incidentally.